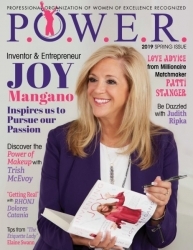 Manhasset, NY, April 04, 2019 --(PR.com)-- Tonia DeCosimo, founder and editor-in-chief of P.O.W.E.R Magazine is proud to showcase Joy Mangano, an amazing and innovative woman, on the cover of the spring issue of P.O.W.E.R. Magazine (Professional Organization of Women of Excellence Recognized) and powerwoe.com. With almost 20 years of successful sales, a best-selling novel, and a movie based upon her life, Joy Mangano is someone that every woman aspires to be: a self-made millionaire. She is, first and foremost, an American inventor known for such products as the Miracle Mop, Huggable Hangers, and the Forever Fragrant line. Born on Long Island, New York in 1956, Joy Mangano earned a B.A. in Business Administration from Pace University. After college, Joy got married and had three children. By 1989, she was divorced and taking out her frustration on housework, particularly mopping. Joy found that she absolutely hated constantly getting dirty mop water on her hands while cleaning. She spent a few years developing a completely new mop concept and, in 1990, Joy created a prototype. She had 100 of them made after saving and borrowing $100,000 towards the development of the Miracle Mop. Through advertising and personally selling to local businesses, Joy sold a few thousand mops the first year, with her children helping her fill the orders. In 1992, she pitched the Miracle Mop to QVC executives. It was given a slot without Joy, and sales were underwhelming to say the least, so she suggested that if she appeared on the broadcast herself, the mop would sell. Her first appearance on QVC helped the Miracle Mop sell out. They sold more than 18,000 mops in less than thirty minutes. That initial appearance set the standard and she has since sold millions of mops and created a variety of other products including the Rolykit, Huggable Hangers, Forever Fragrant and the Piatto Bakery Box. In 1999, Joy sold her company, Ingenious Designs, to the parent company of the Home Shopping Network (HSN). Fifteen years later, the biopic movie “Joy” was released and has earned two Golden Globe Awards, one Oscar nomination and numerous other awards. The national bestselling novel “Inventing Joy” was released in 2017. Joy takes her readers through her inspirational rags-to-riches story and points out the hard lessons she learned along the way. To give a hand up to women who are struggling, Joy has established The Joy Mangano Foundation which has established a partnership with Rising Tide Capital, a nonprofit organization. For over a decade, Rising Tide Capital has been working to empower many first-time entrepreneurs and single mothers to use their creativity and talents so they too can build businesses that transform their lives and the lives of those around them. They provide full scholarships for entrepreneurs to attend their nationally recognized business management training curriculum, and they provide on-going support as their entrepreneurs turn their dreams from ideas to reality. Through this partnership, Joy continues to mentor and consult with entrepreneurs and continues to make a difference in women’s lives. In addition, P.O.W.E.R. Magazine’s spring issue is chock full of articles about their amazing members who are hard working women that are successful in their varied industries and professions through their passion and dedication. For further information, contact www.powerwoe.com. P.O.W.E.R is an online community as well as a digital and exclusive print magazine featuring celebrities and everyday hardworking professional women. Our mission is to provide a powerful network of empowering women who will mentor and inspire each other to be the best they can be. Through our valuable services, our members can network, collaborate with like-minded professionals, gain recognition and obtain knowledge from those who have already achieved success.